"prepare your brain for something new !! for something unbelievable ! this is dragons megademo 1"
Trop bon :-) la "unlimited bobs"
The first megademo i ever saw !!! Damn, that's when i fell in love with DEMOS !!! Oh my GOD - What a classic!! When I first saw this demo I just couldn't believe my eyes. In the early days this demo really was "State-of-the-art". Yeah, and that part with rasters, first time i heard a mod sound like that. Nobody make theses bob's moving like that. I wonder what they do now. Fonts, colors are so nice, scroll is smooth as hell, great tunes, innovation. I looooooove you Dragons ! Si quelqu'un sait ou trouver la demo GEN4. A big f*ck you to Mr. Video (yes we will never forget your lameness act) even after all those years ! lots of fake effects, actually only fake effects, but very cool!!! I believe that they were the first to discover this effect unless there was an attempt on C64 before for example. track is called "ZZZAX SPACESHIP505"
StanZ: cant play the tune. It gets loaded and then nothing happens when tryung to play it. Too bad, this tune was really good. Still, I did not manage to use BSEditor, there must be something wrong with my pc. We even made a Java version a few years ago. That music you're talking about is a conversion of a 70's synthtune also called spaceship 505 (or spaceship sos don't remember). Thank you to have supplied all this good information! I can't believe it lol. I'll search the mp3 tonight. I like the ST version too, by Tao. Hell yes ! The Atari port, part of the vodka demo, is imho the best I've seen on ST.
And this nearly 15 years ago. Memories :) Ruled back in the days and still does! Loooooove this!! Best megademo there is. I liked this demo. I dont like this style anymore though. but it rocked once. definitely! great copper-b/part (only outdone by total trible trouble, perhaps) music totally roxx. "Never forget us ... It is now time to turn off you computer (we think it is an amiga right)"
20 years later we have it running on various platforms ... Odd. Major greets to all our friends and supports! Rules big time. Nothing more to say. Respect! This demo blow my mind, and made me a big fan of Corsair !! So impressive code, and it's the first time I've heard Moby music !! 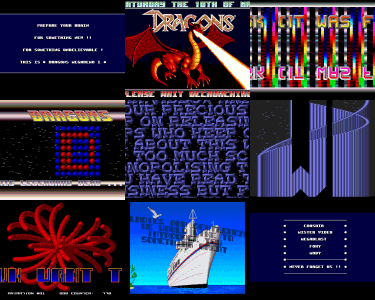 Copper bars, fantastic beautiful bobs (and well unlimited), lots of scroll and sure we need to switch off the amiga for really quitting the demo ! Perfect one ! At that time my god was Promax and Slayer, after seeing this demo Corsair immediatly join them !! Holy guacamole boyz... I just watched this now nearly 20 years after I wrote the code... Whoa... so many memories coming back. I remember spending countless hours coding trying to get everything right: the colors, the transitions, the scrollings, the rasters and of course the unlimited bobs (hehe). Good old times for sure. And seeing all you guys' comments really makes me feel good. I knew I was up to something at the time but I never really realized people like it that much. Thanks a bunch boys. damn, me almost already forgot about this gem! getting old, eh?! watched this more than a lot back then, Mr.Cursor ruled on c64 and so he did on Amiga! rulez added on the 2013-07-23 00:37:00 by ɧ4ɾɗվ. added on the 2013-07-23 00:45:29 by ɧ4ɾɗվ. Loved it back in the days. wooow! was looking for this for ages!! definitely a masterpiece of early amiga days! don't know why, but I've somehow always thought that it was released earlier than that (somewhere in 1989). Copper blast ! Really great demo. Still nice to watch. Great ideas and tunes for that time. Thanks again to Buckethead for sharing this production here. This was the result of a long work from my brother (Corsair). We were so proud to release this first great production. Ooops, forgot to vote ! Also, my first Amiga assembler was MasterSeka 1.82, modified by Corsair/SkidRow (at that time). Still have it on my disk (both: megademo & asm, just for nostalgia). What a pity!! I have never seen this back in the days and it is pretty good! page created in 0.025865 seconds with 15 queries.